Baltimore’s Sun Club have announced their debut LP ‘The Dingo Durango’ is out on October 30th via ATO Records. The album joyously deconstructs the traditional pop song and rebuilds it with off-kilter time signatures, gleefully unhinged vocals, and sunny hooks that sink deep into your already fevered brain. Having previously released ‘Tropicoller Lease’, in which the band fends off life-size troll dolls with only their wits and their instruments to protect them, the band have released a new video for ‘Summer Feet’ , which is slightly more chilled out, in a literal way. After self-releasing a well-received 7” and an EP, the members of Sun Club became a band as childhood friends over ten years ago and have toured endlessly ever since, moving from basement gigs to bars to opening up shows for the likes of Alvvays, FIDLAR, and Fat White Family. 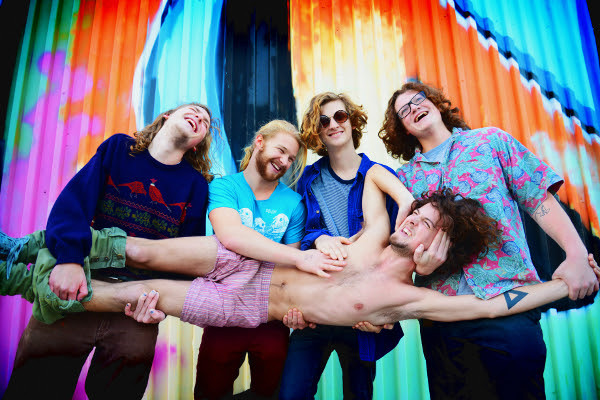 The band will spend 5 weeks touring the US and Canada with The Districts. The Baltimore band recorded ‘The Dongo Durango’ using an old warehouse space just outside of their hometown as a makeshift studio. They recorded the album live, all the better to capture the raw and raucous energy of their concerts. There they channelled influences of fellow Baltimore greats from Future Islands to Dan Deacon, as well as drawing from their own musical libraries that include DEVO, Beach Boys, and The White Stripes. The band are also currently on tour in North America in support of the new album.